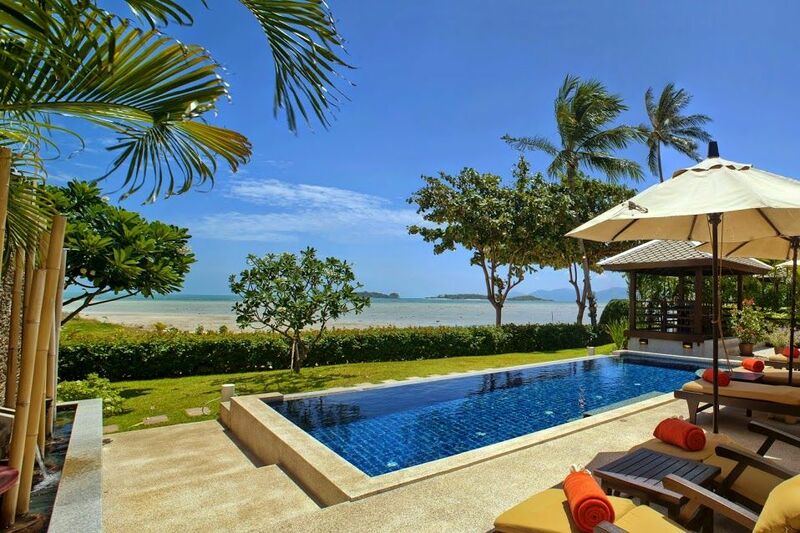 Luxury holiday home perfectly situated on a palm fringed beach with stunning views across the Gulf of Thailand to nearby tropical islands. Ideal for friends and family groups the accommodation includes three spacious air-conditioned bedrooms, with oriental inspired bathrooms. The fully air-conditioned indoor living areas comprise of two separate pavilions. In one a comfortable lounging area with satellite TV and music system, and formal dining, fully fitted and equipped western kitchen and a bedroom with a large double bed. The other pavilion comprises of two bedrooms, one with an extra large double bed and the other with large twin beds. The outdoor living area includes a spacious wooden terrace with table and chairs for relaxation and eating 'al fresco', a sunbathing area and a large infinity edge pool with submerged seating. To one side of the pool is a water feature and to the other a sala with seating. The pool area is equipped with cushioned sun loungers and parasols. * Daily maid service included. * All bedding, bath and pool towels included. We provide a 'pay as you go' mobile phone enabling local and inexpensive overseas telephone calls. The beach in front of the villa is a peaceful 'non tourist' beach with a fishing boat marina and a beachside boutique hotel (Deva Beach Resort) at the southern end end. The water here is shallow and not suitable for swimming. The nearest swimming beach is at Choeng Mon, a 5 minute drive with beachside bars, restaurants and watersports. There are at least four bars/restaurants within walking distance of the villa, the nearest being a 2 minute walk. There are many more within a 10 minute drive, some of which are exceptional and most are excellent value. The nearest convenience store is a 10 minute walk where you can buy basic foodstuff and toiletries. The local market is a 15 minute walk, here you can buy fresh seafood, fruit and vegetables at local prices. The islands main shopping mall with a large Tesco Lotus Supermarket together with numerous shops and fast food outlets is a 15 minute drive. Plai Laem has the largest Buddhist temple on the island and the famous 12m high Big Buddha statue is a 15 minute walk, close to the local market. Chaweng, a 15 minute drive is the main tourist resort on the island, it has the largest and most popular beach running parallel to the main street which is crammed with shops, bars and restaurants. This is the main centre for evening entertainment. Bophut 'Fishermans Village' is a 10 minute drive, and altogether different and more sophisticated than Chaweng, it has the islands only walking street with some nice bars, restaurants and shops lining the waters edge. We always recommend car hire to our guests for comfort, safety and convenience but for this villa it's optional owing to the proximity of the local services and taxis if required are readily available. Click on the following link for more information about Plai Laem.